Across both themes, Finland (1) and Norway (2) continue to lead the Index. For both countries, the Under 15 Age Group pillar scores are highest in the Learning theme and decrease gradually across age groups. Scores across the Employment theme are consistently high, with Finland landing the top spot for the 25–54 core working age group. Kazakhstan (37) and Ukraine (31) are the top scorers among upper- and lower-middle income economies, respectively. In the low-income economies, Tajikistan (65) and Uganda (102) lead the group. 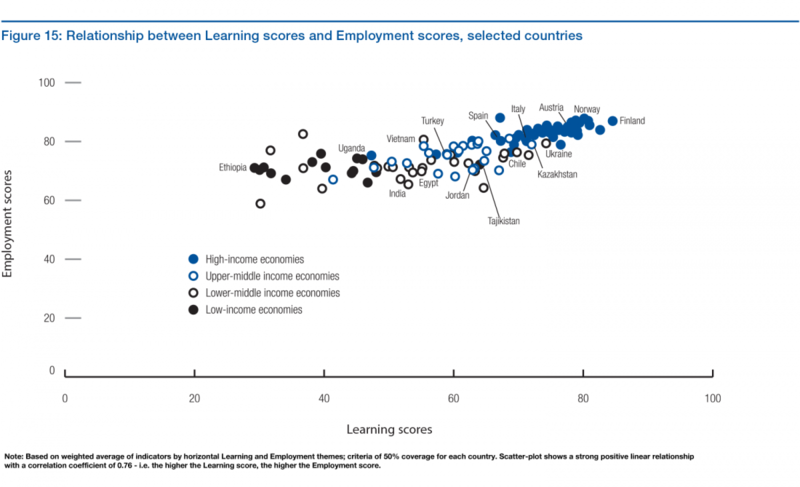 Tajikistan stands out among low-income economies with the highest score in the Learning theme. Although its score in the Employment theme does not differ significantly from its peers, Tajikistan has the highest incidence of high-skills employment among the group. Figure 16 presents a further selected analysis of the relationship between the Learning and Employment themes, specifically the gap between the proportion of the workforce that are tertiary educated and the proportion of employment that is high-skilled, ordered by the size of the gap (regardless of the direction of the gap), moving from the left to the right of the chart. A significant gap in these two indicators represent high skills mismatch and an inefficient use of the country’s resources—regardless of whether the share of the tertiary educated workforce is higher than the share of high-skilled employment (overeducation scenario) or the share of high-skilled employment is higher than the share of the workforce that is tertiary educated (undereducation scenario). Armenia (43), Austria (11) and Italy (35) have the largest gap among countries for which data was available for this analysis. These countries pose a different type of “inefficiency”—Armenia indicates that the gap is due to “overeducation” and Austria and Italy indicate a level of “undereducation” for the types of occupations employed in the economy. While these gaps may be a result of temporary economic cycles, they often point to longer term underlying issues that prevent countries from achieving their full human capital potential. Appendix C provides a full overview of countries’ educational attainment rates and employment share by skill level. 23 In calculating countries’ sub-scores in the Learning and Employment themes, the overall global population weighting (see Table 2) is applied to the simple average of the indicator scores across the horizontal themes in each Age Group pillar. 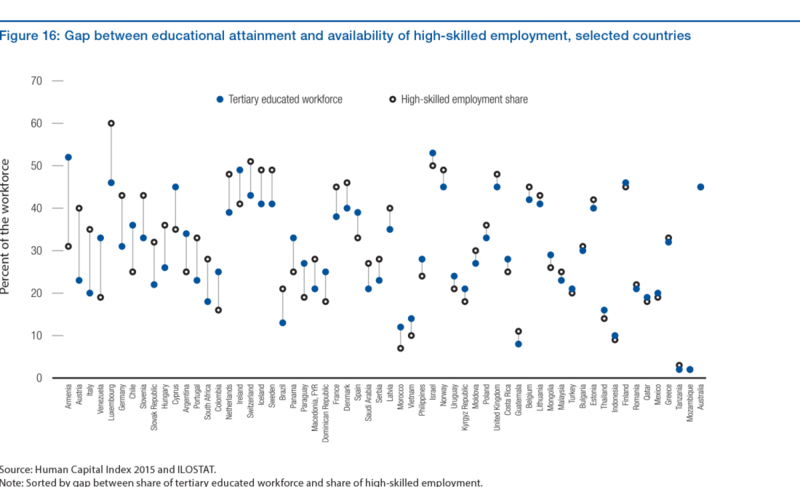 Countries are required to have at least 50% indicator coverage for both the Learning and Employment theme in order to be included in the graph and analysis.